China’s northernmost city of Harbin is a popular winter destination for both local and international tourists alike. Hundreds of thousands flock in freezing January temperatures to attend the Ice Lantern Festival, an annual festival of international prominence that sees the city play host to a multitude of magnificent ice and snow sculptures. This does not mean, however, that the city has nothing else to offer – in fact some of northern China’s best historical sights and recreational resorts are located here. The famed Ice Lantern Festival was first established in 1985, and it is held annually from the beginning of January through the month of February. The city’s location and arctic climate provides an abundant amount of ice and snow that is so necessary for the festival’s success. One of the key components of the festival is Harbin’s humble ice lanterns, which were originally created by local peasants and fishermen who used ice lanterns as jacklights in winter. These windproof lanterns gained great popularity in the region, and from then on novel changes and advancements in techniques resulted in the various delicate ice lantern displays. 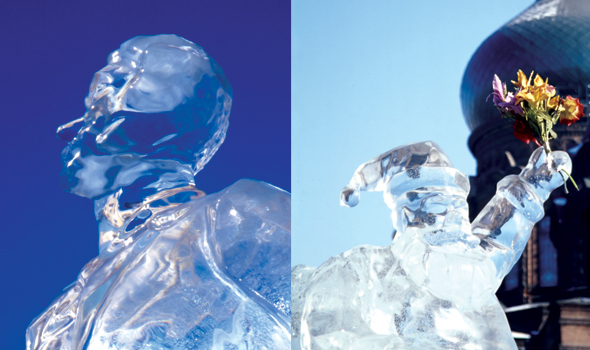 Subsequently the Ice City of Harbin grew to become the center of ice and snow art sculptures in China, and now the Harbin Ice Festival is not only a showcase of ice and snow art, but a cultural event for international exchange, with artists and fans from ?all over the world gathering in Harbin ?to participate in the festival. From November onwards, the Snow Sculpture Exposition is open at the Sun Island Park, the world’s largest indoor ice and snow art museum. 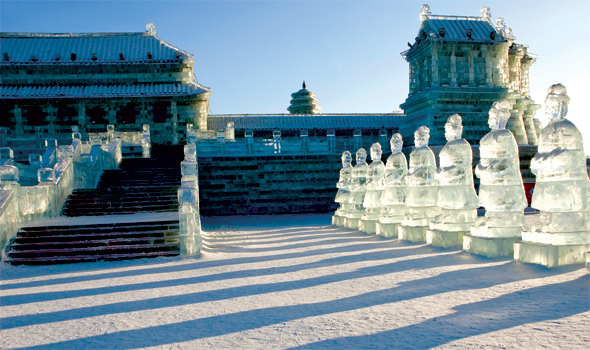 There is also the Harbin Ice and Snow World, one of the world’s largest ice architecture parks, with sculptures deriving from traditional Chinese fairy tales and world famous architectures. 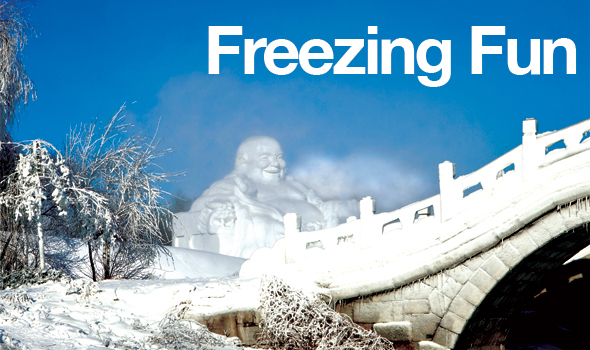 Zhaolin Park is another must-see attraction that features a traditional showcase of ice lanterns with water, lights and natural ice from the Songhua River. Touring the various ice lantern parks are a popular tourist activity here, and other than sight-seeing, there are also various activities such ?as ice fishing, skiing and much more. The exhibits are best viewed at night when the sculptures are lit from within in tones of pink, red, blue, green and yellow. The numerous ice sculptures and exhibits around the park can be toured in the park on foot, but frequent stops at tea tents on the grounds are of the utmost importance if you want to keep somewhat comfortable in the sub-zero weather. The tea tents are outfitted with cozy space heaters and piping hot tea, which are much needed after a mere thirty minutes outdoors atop the ice sculptures. A tour of the grounds can also be arranged with one of the many horse and carriage operators in the area. Be warned, though. Physical exercise makes a big difference in body temperature and there’s no way to keep warm from the back of a carriage. We recommend doing a short, quick tour of the grounds by carriage before continuing the rest of the way on foot. 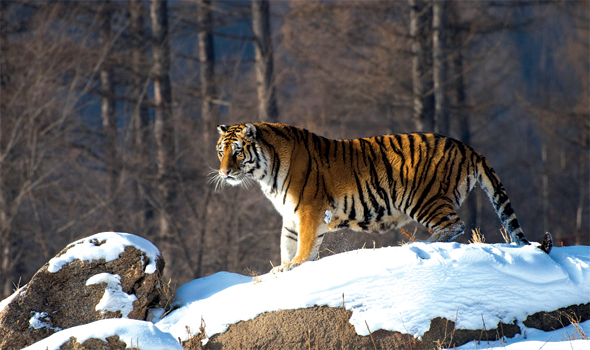 The Sun Island Park is the largest recreation center in Harbin, and one of its must see attractions is the Siberian Tiger Preserve. The Preserve is home to the endangered Siberian Tiger, the largest member of the cat family. These beautiful creatures can grow up to 320 kg! The park boasts about 800 Siberian Tigers of all ages, which makes it the largest natural reserve for Siberian Tigers in the world. Visitors can ride in an open bus with metal caging around it, and purchase strips of meat to hand feed the tigers. If you’re into it, you can buy live animals such as ducks, chickens, and even goats or cows to feed the tigers. Park employees will set your animal free among the tigers for a showcase of animal instinct at its most basic. This option is definitely not for the faint-hearted, nor for obsessive animal lovers. Zhaolin Park, located at the northern end of Zhaolin Street at the bank of Songhua River, is also worth a visit. Set up in 1900, the park was built in memory of the General Li Zhaolin, and was originally named Daoli Park before having its name changed in 1046. The park’s enchanting scenery is the main draw, with the Hua Guo Mountain to the East and the Mei Gui Mountain to the West. The park is sectioned into various gardens and man-made lake with a skating ring and exhibition hall. The Park is home to the original Ice Lantern Festival, and while the newer and larger Snow and Ice World in Sun Island Park attracts a larger crowd, a smaller, more traditional festival is still held here in Zhaolin Park. Unlike the internationally inspired structures at the Snow and Ice World, the ice structures in Zhaolin Park are all Chinese inspired, with various traditional elements such as the red lanterns, dragons and flowers aplenty. Finally, there is also the Yabuli International Ski Resort, about 200 km east of Harbin, the perfect place to go if you’re into skiing. Located in Shangzy City, this is the largest ski resort in China, and it provides excellent ski conditions with high mountains and natural snow. The ski resort is sectioned into two separate areas – the competitive section and the leisure skiing section. The competitive section is built to international skiing standard, providing an environment for professional skiers with altitude reaching up to 1,374 meters. The leisure section is about 1,000 meters high and provides a comparatively safe environment for leisure skiing. Tourists can easily ski down a giant slide from the top of the mountain. This is made especially for skiers who are not confident enough yet to ski on their own. The resort is approximately 4 hours away from Harbin, with various buses and trains going to and from throughout the day. Besides skiing, visitors can also enjoy a multitude of entertainment facilities at the resort, such as hot-air balloon rides, paragliding and mini golf. The beautiful scenery makes this an excellent destination for your winter sojourn, and even in the summer tourists can escape the heat and enjoy an array of outdoor activities. Unearthing Asia is a travel zine focusing on Lifestyle, Culture and Attractions all over Asia. Don’t miss out on the best majorca holidays ideas and inspirations in the region of Asia, such as this list of divers paradise in Indonesia.